We don’t waste your valuable time!! The shop monitor shows your estimated waiting time, and the ticket numbers as they come up, allowing you to visually check your place in line. 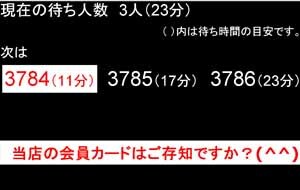 ※ The displayed waiting time is just a rough estimation. Please note that your number may be called earlier or later than the indicated time, depending on the pace of previous customers’ haircuts. You’re free to stay in the shop, or leave and return, until your turn comes. ※ Some shops have free WiFi service for your convenience. Information on the shop, and helpful messages, are also shown on the monitor.